Implantable peripheral neurostimulation was introduced in 1969 as a potential treatment for certain neuropathic pain syndromes, primarily involving the limbs. While a few early studies included implants for occipital neuralgia, serious interest in its potential as a treatment for head pain came only after our 1999 report of positive findings in a series of patients with occipital neuralgia. Subsequent investigators confirmed these initial findings, and then extended the application to patients with various primary headache disorders, including migraine. While most found a therapeutic response, the degree of that response varied significantly, and analysis suggests that the issue of paresthesia concordancy may be central, both in explaining the data, as well as providing direction for future endeavors. Therefore, while at present peripheral neurostimulation is gaining increasing acceptance as a treatment for chronic headaches, the precise clinical indications and procedures, as well as the underlying neurophysiological mechanisms, are still being worked out. Migraine is a common disorder of the brain that exacts a significant toll on the human condition. It afflicts at least 4 % of the population and dramatically impacts function in terms of lost school and workdays . The burden on patients and society increases if the migraine becomes chronic, a cohort in which over 50 % of patients feel their treatment to be unsatisfactory . Recognizing and responding to this clinical challenge, over the past two decades professionals have developed various implantable neuromodulation techniques and evaluated these as potential treatment alternatives in this unfortunate patient population. Here we review the significant aspects of peripheral neuromodulation for headaches, including its genesis and history, relevant clinical considerations and procedures, as well as the work that has been done to elucidate possible underlying mechanisms of action. Finally, considerations are offered as to potential directions for future investigations. With the publication of their “Gate Control Theory” of pain modulation in 1965, Wall and Melzack provided a conceptual mechanistic foundation for considering direct electrical stimulation of the spinal cord and peripheral nerves as a potential treatment for chronic pain . The prophetic nature of this work was redeemed in 1969, when Shealy described positive responses in patients implanted with spinal cord stimulators (SCS), and Long implanted the first commercially available peripheral nerve stimulators . Thereafter, the bulk of clinical investigations involved various applications of implantable SCS for chronic back and extremity pain, and indeed, over the years SCS has become widely accepted as a standard treatment methodology for some patients with chronic back and extremity pain unresponsive to more conservative measures . Peripheral nerve stimulation (PNS) therapies for chronic pain developed in parallel to SCS, albeit somewhat more slowly. Over the 1970s and 1980s, Long, Nashold and others documented favorable responses to open surgical PNS implants in patients with various neuropathic pain syndromes, most commonly of the limbs [6, 7, 8, 9, 10, 11]. While a few studies included isolated patients with occipital neuralgia, serious attention to the potential of this methodology as a treatment for head pain came only after 1999, when we presented implanted occipital nerve stimulators (ONS) with percutaneously placed leads as a novel therapeutic treatment for intractable occipital neuralgia [12••]. Thereafter, interest in the technique spread rapidly, and subsequent investigational work developed primarily along two clinical avenues—PNS for cephalic neuralgias, and PNS for primary headaches, the findings of which are summarized in Tables 1 and 2. Our report on ONS for occipital neuralgia was quickly followed by a myriad of studies evaluating its application to various neuropathic maladies afflicting the occipito-cervical region, including occipital neuralgia, cervicogenic headache, and other intractable C-2 mediated headaches [13, 14, 15, 16, 17, 18, 19•, 20••, 21, 22•]. All groups reported consistent, remarkable success rates on the order of 70–100 % (mean 89 %) (Table 1). Over this same period, other investigators applied supraorbital nerve stimulation (SONS) to neuropathic pain perceived over the frontal region and found similar results. In 2002, Dunteman reported successful treatment of two patients with ophthalmic post herpetic neuralgia with an implanted supraorbital nerve stimulator . Succeeding Dunteman were a host of investigations that applied PNS to supraorbital and other painful trigeminal neuralgias, as reported on by Johnson (2004), Slavin (2006), and Amin (2008), who all found long-term 70–100 % success rates [22•, 24, 25]. Yakolev extended the indications in 2010 when he successfully treated a patient with atypical facial pain with subcutaneous, octipolar arrays over the mandible . In 2012, Stidd had two patients with trigeminal neuralgia respond well to combined SONS and infraorbital nerve stimulation (IONS) . Evaluating these studies as a whole, we find virtually the same success rates of 70–100 % (mean 88 %) as we do with ONS and occipital pain. Therefore, on the one hand, it’s interesting that the reported response rates from the groups treating facial pain with peripheral trigeminal stimulators are virtually identical to the corresponding rates reported by those treating occipital pain in the same manner (70–100 % success rates). However, this should not be surprising, as it is in line with, and essentially an extension of, the well-documented effectiveness of implantable neurostimulators for analogous painful neuropathies over the torso and the limbs. Indeed both groups, neurostimulation is being applied to the same underlying problem of neuropathic pain, just over different neural distributions. The initial applications of PNS to cephalic pain continued in line with the historical standard of neuropathic pain until 2003, when Dodick described a positive response to ONS in a patient with cluster headaches, and Popeney found similar results in a series of patients with transformed migraine [20••, 28••]. These were the first reports on the use of PNS for primary headaches, i.e., disorder of the brains, as opposed to a peripheral neuropathic pain, and they generated wide interest in the potential of this methodology. As such, the succeeding years witnessed a series of increasingly sophisticated studies evaluating the responsiveness of primary headaches to ONS, with the corpus of work primarily focused on cluster and chronic migraine headaches [Table 2]. With respect to cluster headaches: following Dodick’s 2003 report on ONS, most of the clinical work was published by seven different teams, who on average reported a 62 % response rate, which was notably lower than those rates seen when neurostimulation was applied directly to the area of pain, e.g. the over 90 % rates found with PNS for occipital and various trigeminal neuralgias [29, 30, 31, 32, 33, 34, 35, 36, 37, 38]. Arguably the most interest with respect to ONS and primary headaches has centered around migraine. 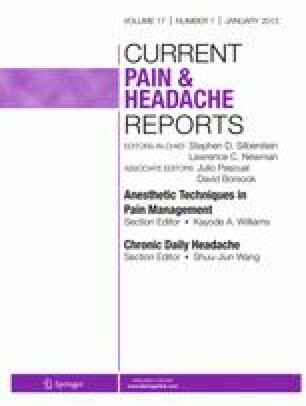 Beginning in 2003, an initial series of relatively small studies documented positive results [19•, 35, 38, 39], and ultimately, each of three primary manufacturers undertook large, multicenter, randomized, double-blinded, prospective studies evaluating the responsiveness of chronic migraine to ONS. These included Boston Scientific’s PRISM study (125 pts), St. Jude (105 implants; 52 controls), and Medtronic’s ONSTIM study (33 implants, 34 controls) [40•, 41••, 42••]. Using the historical standards for a positive response of over 50 % improvement in either pain level or frequency, both the Boston and St. Jude studies found no evidence for a significant positive therapeutic result. St. Jude did note, however, significant reductions of the VAS and HA days/mo at approximately the 30 % level and that overall 52 % of patients were satisfied at 12 weeks [41••]. Indeed, Medtronic was the only to find a significant result in a primary variable, as they reported a 39 % response rate at 3 months (vs. < 6 % of controls; p < 0.05) [42••]. Now, even this 39 % rate needs be qualified, as a 30 % improvement in pain was used to define a responder, rather than the standard 50 %. This is very important, as the clear clinical standard used to define a positive response to a trial stimulator is over 50 % improvement. Thus, of the three largest, double-blinded, prospective studies that have been performed to date on ONS and migraine, two found no significant support for an adequate therapeutic effect, and the other found only a very qualified 39 % success rate. In 2009, Narouze published the first successful application of supraorbital nerve stimulation for cluster headaches, using NS implant protocols similar to those applying ONS to cluster headaches [43•]. In 2012, Vaisman fortified the validity of this technique, when he found therapeutic responses to SONS in a series of five patients with cluster headaches [44•]. Based on several convergent lines of consideration (see below), in 2006 we hypothesized that using combined ONS and SONS may be beneficial in some patients suffering from chronic migraine, where the pain is perceived in hemicephalic or global extent (and therefore involving both the trigeminal and occipital neural systems), and in 2009, we reported on strongly positive responses in a series of seven patients so treated. All were quite debilitated due to daily incapacitating migraine, and all responded, with six describing near complete resolution of the headaches (over 90 % improvement). Notably, one patient’s associated hemiplegia resolved as well [45••]. In 2011, Deshpande and Mamis presented independent case studies on similar combined approaches in patients with hemicrania continua (ON-bilateral temple leads) and cluster headaches (ON-SON-ION leads), respectively [46•, 47•]. Also in 2011, Linder was the first to report on combined ON-SONS in adolescent patients, finding therapeutic responses in 11 teenagers [48•]. In 2012, Datta first described the successful employment of combined ON-SONS in a patient with severe migraine who was post surgical decompression of the occipital nerves [49•]. Finally, in 2011 while compiling outcome data on a larger clinical database, our group presented in abstract positive results in a series of 44 patients treated with the same combined ON-SONS system [50•]. When implanting neurostimulator leads, the clinical standard has always been to seek a concordant paresthesia; that is, to effort a neurostimulator induced paresthesia that, as best as possible, covers the anatomic region of perceived pain, which is the clinical indicator that the correct portion of the nervous system is being stimulated . For example, when implanting a SCS in a patient with low back and right leg pain, the technical goal is to place the leads in such a manner as to have the paresthesia perceived over the same regions of the low back and right leg. Indeed, the current standard during all neurostimulator implants is to test the system “on the table” by arousing the patient enough to report the paresthesia location, whereby the surgeon adjusts the lead tips to optimize that coverage. In fact, we are not aware of any reports prior to 2003 where a stimulator was intentionally placed in a manner that did not seek a concordant paresthesia. Even reports of neurostimulators in patients with cardiac or abdominal visceral pain still have the paresthesia localized to the appropriate thoracic or abdominal dermatomes, respectively [51, 52, 53]. In patients with occipital neuralgia, or other headaches that are focused over the occiput, ONS produces a clear concordant paresthesia; to wit, the patient perceives the paresthesia over the C1-2-3 distribution, which is the same area where they feel the pain. The same holds true for patients with neuropathic pain centered over the supraorbital region that is treated by a supraorbital stimulator. Thus, all of the studies related to treating occipital neuralgia with ONS and the various localized trigeminal neuralgias with SONS/IONS should be understood from the standpoint that they are all simply following the historical standard of concordant paresthesia. Indeed, as noted, their relative high reported success rates of 70–100 % (avg. 89 %) are very much in line with analogous studies involving concordant paresthesias for neuropathic pain over the torso and limbs. While possibly less obvious at first, the issue of paresthesia concordancy holds for some patients with migraine as well. Both Popeney and Oh reported a subset of patients with transformed migraine whose pain was primarily perceived over the occiput [18, 20••]. Further, the reports on ONS for chronic migraine by some of the studies, including the Matharu, Schwedt and Trentman reports, explicitly noted that most, if not all, of their patients had pain that was prominent over the occipital region [35, 38, 54••]. Thus, while all of these groups were evaluating migraine responsiveness to ONS, the patients so studied had pain primarily focused over the occiput, and thus followed the historical standard of a concordant paresthesia. Most migraine headaches, however, are experienced over the frontotemporal regions, and in these cases, ONS produces a non-concordant occipital paresthesia. With that in mind, we believe that Dodick’s 2003 report on the use of ONS for cluster headaches was a true watershed event, as it was the first report in the history of neurostimulation and pain to document the successful treatment of a patient in pain with a non-concordant paresthesia. As it was unprecedented, it presented a challenge to understand how stimulating the occipital nerves could ease pain over the distant trigeminal nerves. Now, its unprecedented nature notwithstanding, the extensive series of reports succeeding to Dodick’s convincingly demonstrated that ONS did ease migraine pain in some patients. On the other hand, the accumulated database is also persuasive that the associated response rates consistently fall below those groups treated with a concordant paresthesia, e.g., occipital neuralgia treated with an occipital stimulation. As summarized in the tables, whereas over 90 % of patients respond to NS systems producing a concordant paresthesia, less than 40 % of patients with chronic migraine will do so (considering the benchmark double blinded studies). The results of the significant studies on PNS and headaches are summarized in the tables, which divide the patient treatment groups into two: those implanted with systems that produce a concordant paresthesia, e.g., ONS for occipital neuralgia (Table 1), and those that produce a non-concordant paresthesia, e.g., occipital stimulation for the pain of migraine headaches perceived over the trigeminal fields (Table 2). Contrasting the results from the “concordant” group against those of the “non-concordant” group reveals a striking difference in the response rates, and one that pivots on the single variable of paresthesia concordancy. All five individual “concordant paresthesia” groups of Table 1 reported very high and consistent response rates (88 %, 89 %, 89 %, 98 % and 100 %, respectively) for an overall response rate of 93 %. These results stand in sharp contrast to those found in Table 2, which are those of the groups studying implants that produce non-concordant paresthesias, which overall found less than a 40 % response rate. Close scrutiny of the results of the benchmark Medtronic, Boston Scientific and St. Jude ONS studies suggests that they all actually confirmed minimal to no response of patients with chronic migraine to ONS. From that respect, not only did both the St. Jude and Boston studies fail to show a significant therapeutic response, Medtronic’s report of a 39 % rate still did not meet the historical, clinical standard of only counting patients with 50 % or more improvement as responders. It is this dramatic difference in the observed success rates that provides such compelling support for the central importance of paresthesia concordancy. Questions arise as to how to best understand why ONS may be less effective for migraine headaches than for occipitally focused headaches; or alternatively, why combined stimulation of both the occipital and the trigeminal branches may achieve improved results for patients experiencing migraine pain in either a hemicephalic or global distribution. These questions should first be considered from the context of our current understanding of the related functional neuroanatomy, where interest has thus far largely centered on the trigeminocervical complex (TCC) and potentially related higher central nervous system (CNS) centers. Though the data remains quite limited, it does provide some insights. The TCC is formed by the caudal trigeminal nucleus and portions of the upper three cervical dorsal horns. Nociceptive afferents from both the trigeminal nerve and the occipital nerves (C1-2-3) partially converge on the same second order neurons in the TCC, and thus to a final common pathway to higher centers for cephalic nociception and modulation [55••, 56, 57, 58]. Bartsch and Goadsby’s meticulous animal studies convincingly demonstrated both this discrete convergence, as well as subsequent sensitization of second-order TCC neurons following a sensory barrage, findings that likely underlie the clinical observation of referred pain seen with primary headaches [55••, 56]. In 2003, Popeney suggested that the TCC may be the neuroanatomical substrate underlying the clinical issue of paresthesia concordancy [20••]. There is also early but convincing evidence for the involvement of higher CNS centers with neuromodulation. Utilizing positron-emission tomography (PET scans), in 2003 Matharu documented responsiveness of some of these higher centers to ONS. Paresthesia-correlated activation was observed in the cuneus, pulvinar and anterior cingulate cortex. Activation of the rostral dorsal pons demonstrated a coverable response with pain scores and may be particularly important in the genesis of chronic migraine [54••]. More recently, Magis documented similar PET scan findings in patients with chronic cluster headaches . One potential mechanism accounting for the responsiveness of frontal pain to a distant occipital paresthesia relates to the experimentally confirmed observation that chronic occipital pain may ultimately refer to the frontal regions, and thus globalize [57, 58, 60, 61]. This implies that there is a subset of patients with holocephalic headaches, whose pain originated in the occipital region and only over time globalized, thus explaining therapeutic responses to treatments aimed at the occiput, the actual source of the problem. In 1992, Anthony found that 48 % of patients with idiopathic migraine headaches, and thus a frontal pain component, responded to occipital nerve blocks and concluded that the frontal component of the pain was referred . Thus, experimental evidence of referred occipital pain, combined with the proposed possible substrate at the TCC, provides a conceptual framework for a potential mechanism in some patients with frontotemporal migraine pain to therapeutic occipital measures, in the sense that these measures are indeed focused on the actual source of the referred pain. The typical patient being considered for a neurostimulator implant has debilitating, chronic headaches and has been under the care of an experienced headache specialist for months or years. Commonly, the headaches were under good control for a period, but ultimately became chronic and refractory to all reasonable measures, at which point the patient becomes a candidate for trial neurostimulation. Following a successful trial, the permanent unit (10-year battery life span) is implanted. Postoperatively, most all patients report virtually immediate relief from their headaches, and ultimately marked reductions in medication requirements; improvement in their overall sense of well-being, and associated marked increases in their and energy and activity levels. The system is easily maintained, and patients find that they are able to return to family life, work and social interactions. Headache diagnosis—PNS has been studied and found effective in various types of headaches, including migraine, cluster, hemicranias continua, chronic daily headache, transformed migraine, tension type headaches, occipital neuralgia, post-traumatic headaches and cervicogenic headaches, amongst others. The specific techniques involved in placement of both the trial and permanent units have been well described in the literature and will not be reviewed here. The trial stimulator is percutaneously implanted in the outpatient setting. Upon recovery, the patient is instructed in the operation of the programmable battery and discharged. During the next five days, the patient is advised to test the unit under all practical circumstances, including work, play, travel, etc. The patient returns typically five days later for removal of the unit and evaluation of the results. A trial PNS is very reliable in predicting the results of the permanent unit. While false-positives may occur, the fact is that less than 2 % of patients ever return after a permanent unit, complaining of loss of efficacy and requesting removal. The underlying reason for this reliability largely relates to the typically dramatic nature of the response—one way or the other. That is, most patients typically report either a markedly positive response, often describing near complete resolution of the headaches, or they tend to virtually not respond at all. While of course possible, it is in practice rather unusual for a patient to be “unsure” as to whether or not the trial stimulator effectively eased their pain. From a different viewpoint, the trial period is showing the patient what they can expect with a permanent unit. In this sense, the trial is quite truly a “test drive” of a neurostimulator, such that the patient knows before the permanent implant exactly what they can expect with the unit. It is one of the few times in medicine that there is indeed a test to see how well a patient will do with a specific surgical treatment that is available before the patient has the surgery. At the conclusion of the trial period, the patient is seen in the office where the unit leads are removed and the response evaluated. While the minimum requirement for a positive response is over 50 % improvement, the majority of responders describe 80 % to over 95 % improvement. For patients finding a positive response and desirous of proceeding, the permanent implant is scheduled. A permanent stimulator involves the placement of an implantable pulse generator (IPG) and from 1 to 4 leads based upon the patients headache, pain location and trial results (Fig. 1). This is a relatively straightforward surgical procedure that is accomplished either as an outpatient or with an overnight stay. As all incisions are relatively superficial, recovery and resumption of activity is fairly rapid. Most patients are able to resume normal activities, including travel, within 2–3 days. Those who have sedentary work positions may return to work within a week. Patients should avoid extreme physical activity for the full recovery period of 6 weeks, at which point all restrictions are removed. Following the 6-week recovery period, the most remarkable thing about managing a stimulator is how simple it is. The only maintenance required involves the simple process of twice weekly recharging their unit, which involves simply sitting next to a portable recharging unit (RF couple) for an hour. Following the initial 6-week recovery period, we often have patients return to the office on an as needed basis only. Thus, from the patient’s standpoint, most everything improves. Medication requirements—almost invariably meds markedly decrease, corresponding to the improvement pain. Over 30 % of patients no longer require any routine meds, and most of the rest see marked reductions. No longer frequenting medical facilities or having to stay in due a headache, patients are able to fully return to normal activities of daily living, including interacting with the family and enjoying social occasions. Further, we impose absolutely no activity restrictions. We have patients that returned to, or became involved with, various strenuous physical activities, including all forms of exercise, gymnastics, horseback riding, martial arts, baseball, and skiing, without problems. PNS for head pain is generally considered to be very safe over the long term. In practical terms, complications are uncommon and are largely limited to a small (3–6 %) risk of infection. However, given the subcutaneous location of the systems, any infections are superficial and invariably respond to antibiotics, and usually with temporary explant of the device. We are unaware of any reports in these patient groups of serious complications that have resulted in long-term morbidity. Other clinical considerations here relate to technical issues due the nature of the implant, and include lead migration or fracture and IPG malfunction, and though frustrating, are easily remedied with a short outpatient procedure. Following our initial introduction of ONS for occipital neuralgia in 1999, a plenitude of clinical reports both confirmed our initial findings and also initially extended the methodology to the frontal region and the trigeminal neuralgias, and then ultimately to primary headaches, particularly clusters and chronic migraine. Indeed, virtually all extant reports find a therapeutic response to PNS with minimal downside, and when considered together with the basic science research, provide a coherent, consistent and substantive basis for PNS treatment for the cephalic neuropathic pain disorders, as well as for primary headaches. While there are many clinical and foundational issues to address going forward, the database supports an optimistic vision for the future of implanted peripheral nerve stimulation and head pain. In considering that future, we again emphasize the compelling evidence that supports moving towards considering paresthesia concordancy, both when planning system implants for individual patients, as well as for future research protocols. No advice, direction, or assistance (financial or otherwise) was received for this paper. Prior to 3 years ago, the author served as a consultant to St. Jude Medical and is part of the author group that is just now presenting the results of St. Jude’s completed multicenter study on occipital neurostimulation and migraine headaches.